Alter Egos spotlights an EHS student or staff who has a hidden, awesome talent; who has interests that lie off the beaten path; or who has had a life experience that others would benefit from hearing. It interviews Pioneers who are becoming the best version of themselves in order to inspire others to follow suit. In the fourth installment, I sat down with a young man who made his first kayak at age 13, made his first guitar at 16, and has traveled across Wyoming and Alaska, the multitalented Jacob W. (‘17). 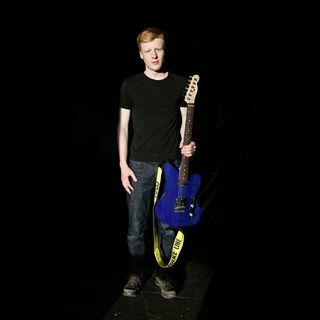 Jacob debuted that electric guitar in this spring’s Jam Band Concert as a member of The Terminally Chill. Jacob, where are you from? Louisville, Kentucky. I’ve always lived there. How’d you hear about Eagle Hill? My parents found it and recommended it to me. I toured here two years ago and liked it. Coming here, I was a little nervous, but I grew to like it. I had a good roommate and made some good friends. I understand you’re a craftsman. How’d get started? Well, I made a kayak when I was 13. I hadn’t done much kayaking, but there was a class at Skipping Fish Boat School that taught me how to make a traditional-style, Greenland kayak. It was a lightweight boat with nylon wrapped over it, that you stitch super tight and seal with polyurethane to waterproof it. It’s supposed to be done with seal skin, but there are no seals in Louisville, so I had to make do. And that kayak is still functioning? Actually, since I made it when I was 13, and quite a bit smaller then, I had to re-skin it. The cool thing is that you can take the skin off to repair it, and I expanded the inside. I cut off the fabric and replaced some of the top wood pieces that create the height of the boat to make it taller and create more legroom. Then I re-skinned it with a new, different piece of nylon. Did you carve the paddle too? Yes, it’s a Greenland-style paddle, so it’s different than a normal paddle in that it’s all wood, and it doesn’t have a leaf to it. The blade is much longer and narrower, only a few inches wide at maximum, and that way more of the paddle gets into the water. I glued a few rods of wood together and carved it with a planer and sandpaper, then coated with oil. Can you tell a difference between wood and plastic paddles? Definitely. The difference is more between shape, not as much the material. Some Greenland paddles are made with, say, carbon fiber, but I prefer wood. Have you taken any river trips? In summer of 2014, I did my first NOLS [National Outdoor Leadership School] course. That was two weeks of backpacking in Alaska followed by two weeks of sea kayaking.Then in the summer of 2015, I did another NOLS course in Wyoming for a month of backpacking. And this past August, I went with my dad, brother, and [EHS students] David Berle-Carman (‘16) and Tommy G. (‘17) to the Weminuche Wilderness in Colorado for six days and five nights. It’s a high mountain area, above ten thousand feet. We got to within 250 feet of Storm King Peak, a thirteen-thousand-foot peak, but had to turn back when a snowstorm came. Tell me about that hike. On day four, it had rained the day before quite a bit, and we weren’t planning on doing it, but then woke up to blue skies, so we decided to go for it. We hiked for a few hours and were pretty close to the top when it started to get a little windy. The skies were good so we kept going. Then on the ridge, we looked out and saw a big storm rolling across the valley. It didn’t hit us, but it looked like it was, and we made the safe decision to come down. Yeah, you don’t take chances at thirteen thousand feet. Do you see yourself taking on outdoor leadership roles with NOLS, or with river trips? It’s definitely not out of the question. I’m interested in it. I haven’t decided what I want to do yet in college or after. On my second NOLS trip, we had a four night solo in Wyoming. We had a route to a meet-up point beforehand. Plus we all knew where each other’s campsites were. It was a great experience. Did you bring any musical instruments with you? No, I didn’t want to risk damaging them. But one guy played guitar, and we keep in touch. Let’s talk about that now. How long have you been playing? I was thirteen when I started to play mandolin. I wasn’t super into it at first, but five years later I’ve grown to love it. Then I picked up banjo at fifteen, acoustic guitar at sixteen, and electric guitar at seventeen. So you’re moving through the evolution of stringed instruments. Yeah, I started with bluegrass. My favorite mandolinist is Chris Thile (“teely”), he’s incredible. One of the first mandolinists I became interested in was Sam Bush, from Louisville. I mean, Earl Scruggs is legendary. I also like Bela Fleck. Actually, a friend of mine, Ben Sollee, who’s a cellist, toured with [Fleck] a bit. Ben has been a big influence on me, just knowing him as a great musician has been nice. You’re also in the Jam Band. Tell me about that process of rehearsing, recording, and performing. Last year I got lucky and was able to join in my first year. We had seven people in the band, with a very diverse taste in music, so we could incorporate different styles. There was a heavier side and a more alternative side. This year it’s me, Phil D. (‘17), Seb D. (‘17), and Eddie C. (‘18) on keyboard and piano. How do you go about choosing your set list? We start the class by choosing songs and learning some originals. Phil has written one original that we’ve recorded. It’s been a great experience working through my own part on that song. We all bring in songs we like and pick from that. Because we don’t have a full-time bassist, Phil and I have been picking it up on our own and covering it. Have you written any of your own songs? Um, no, but I’m interested in it, and definitely want to. I’ve made some riffs, but haven’t recorded any of them yet. I understand you’ve built a guitar too? Ha, well, last year in Woodshop with Mr. [Jeff] Myra, I had a great opportunity to make a guitar. I created a custom design that’s a mix between a Fender Jaguar and a Telecaster. It’s not as common, with an offset body shape that isn’t symmetrical. It’s the body of a Mustang, with the neck and electronics of a Telecaster. Actually, Fender recently released their own model of this, shortly after I made my own, which was cool. I just bought all the materials, except for the neck, which I bought on its own. I used a CNC machine, a software-operated cutting system, to cut out the body shape and make the routings. Then I made the contours on it with a file and sandpaper, finished the wood, and dyed it blue. It looks really cool because it brings out the wood grain. How’d you get all the electric components in? I bought them because I can’t make them myself. The pickups, wiring, everything. I did my best with a friend back home who knows how to solder. It almost worked, but not quite, so we took it to a friend-of-a-friend who wired it. I heard he was pretty impressed with it. Will you play it in this year’s show? Oh, you bet. It’s got a brighter tone than the guitar right now, which gives me an expanded tonal range, which is nice. My other guitar now is a G&L guitar, which is the company Leo Fender started after he left Fender. They’re similar to Fenders, but I think they’re nicer and less expensive. It’s in a Telecaster shape with different electronics, and a different neck. What will be the next instrument you’ll make? I will definitely make some more instruments over the years. I think an acoustic guitar would be a big challenge. You have to get everything totally perfect. A mandolin would be awesome, even an electric mandolin. I’d like to make everything. Let’s bring it back to Eagle Hill. Who are some of your mentors here? Dr. Cooke has been a great music teacher and a good friend to me while I’m here. I’ve connected the most with him. Mr. Ward, my advisor, has been great to work with too. What are you thinking for the years to come? Well, I’m going to college next year, but I don’t know where yet. I’m going in undecided, and want to study everything before narrowing it down. I’ve applied to two schools in Colorado, UC Denver, and Fort Lewis College; two in North Carolina, Warren Wilson and UNC Asheville; and the University of New Hampshire. I have an acceptance from Fort Lewis, but I’m not sure about the others yet. So, you’re going to a place that’s remote, mountainous, and full of adventure? And we didn’t even get to talk about his rock climbing skills! As you can see, Jacob likes first to test things, from the environment and school, to new songs and role models. Once he has found value therein, however, he commits himself fully to the place, the project, the people, the adventure. Jacob’s humility allows him to seek wisdom from mentors who can share their experience with him. With that attitude, we know Jacob will find success as he continues to hone his crafts. All of them.